Epistemological? What are you talking about? Why are philosophers, and not just philosophers of language, so interested in the phenomenon of quantifier domain restriction (QDR)? 1. One reason stressed, by Jason in Knowledge and Practical Interests, is that David Lewis based his contextualist semantics for knowledge attributions on QDR. The sceptic is right to suggest that in order to know that p we must be able to rule out all relevant alternatives to p; to adopt fallibilism, according to which one may felicitously utter 'p, but I haven't ruled out possibilities in which not-p', is madness. But the sceptic fails to recognize that this does not set an absolute standard on which alternatives need to be ruled out; it's 'all' of them, but in everyday contexts the domain of 'all' is seriously restricted. In particular, we can properly ignore sceptical scenarios. Indeed, Jason argues against Lewis's epistemic contextualism on the grounds that knowledge attributions don't behave like uncontroversial cases of QDR in the relevant respects (see Jonathan's recent post for discussion of Jason's argument). So a proper understanding of QDR is necessary to evaluate certain proposals in epistemology. made in a room full of book-laden tables in Austin clearly does not impugn the claim that (iii) has quantificational form. The problem of incomplete definite descriptions is really one and the same as the problem of giving a satisfactory account of QDR. iv. Stanley and Szabo (70) take QDR as a test case for determining the source and nature of an expression's dependence on context. That is, the process by which they think we arrive at a satisfactory account of QDR provides a model for discussion of other constructions. So one might hope that a proper understanding of QDR will lead to better understanding of context dependence in natural language more generally. Of course, these do not exhaust the sources of philosophical interest in QDR. But I thought it was worth setting on the table some implications for epistemology, metaphysics and the philosophy of language before turning our attention to Stanley and Szabo's paper. We are seeking to appoint two research fellows for up to four years. You will commence on 1 September 2008, or as soon as possible thereafter. You will conduct research within the scope of the AHRC funded research project ‘Intuitions and Philosophical Methodology’. We encourage applicants working in any area of philosophy who have a genuine interest in methodological issues. You must have a PhD in Philosophy by the time of appointment and be capable of demonstrating outstanding research potential in the areas of the project. A track record of high quality publications will be an advantage. Please include with your application a CV, research proposal (1000 word max) and recent writing sample (5000 word max.). Application forms and further particulars are available from Human Resources, University of St Andrews, College Gate, North Street, St Andrews, Fife KY16 9AJ, tel: 01334 462571, by fax 01334 462570 or by e-mail @ jobline@st-andrews.ac.uk. The advertisement and further particulars and a downloadable application form can be found here. The deadline for the 2008 Graduate Conference here at UT has been pushed back until Feb. 1st. It's mutual-knowledge* that the graduate conferences here have been great in the past, and with David Chalmers and Tamar Szabo Gendler as keynotes, that's surely going to continue. So get submitting! Speaker: Enrico Grube, "In Defense of Content Preservation"
Speaker: David Ivy, "Perceptual Experience as Neither Veridical Nor Nonveridical"
Speaker: Kate Ritchie, "Quantifiers, Context, and Semantic 'Completing' Strategies"
Speaker: Alex Grzankowski, "Against DeRose on Epistemic Modals"
Speaker: David Frank, "Once Again, With Feeling: Affectivity and the Emotions"
It's just occurred to me that this blog's second birthday went by on 12/12/07, and I completely forgot. Thanks to all for reading it, and in particular to those who've been leaving such excellent comments in the threads. I've tried to keep to my promise of making sure things picked up around here at the New Year. We'll see how that keeps up once the semester gets going, but I'm confident it won't be a repeat of last semester. There's been a philosophy of language bias around here recently, and that's going to continue for a while, though I'll throw in some mind, epistemology, and other delights along the way. I'm getting a little out of order here, but I had to read Literal Meaning over the break, so it made sense to offer something on Jason's NDPR review just now, and then come back to 'On Quantifier Domain Restriction'. So not only do we have a range of very different takes on this set of issues, which position one takes seems to shape one's perception of where the real action is. I don't think this is at all unusual in philosophy, but here we have a particularly stark illustration of the phenomenon. Jason's review is of particular note between it takes on directly the difficult tasks of offering a taxonomy of positions in the debate and trying to get clear on what's at stake between them (as befits a review of Recanati's book). It also raises some methodological issues about how the debate should be conducted, and it's these I want to discuss here. I'll come to them a little indirectly, however, via a discussion of the following (independently interesting) issue. So I think a charitable reading of Jason's response to Recanati has to credit him with recognition that at some level Recanati has correctly described the structure of the debate between them. I think that in claiming that Recanati 'misstates the dialectical situation', Jason is referring less to the claim about the structure of the debate, and more to the suggestion that the indexicalist starts with a disadvantage. The contextualist might only have to produce one persuasive case of a truth-conditional effect of extra-linguistic context which is not traceable to logical form, but Jason's real objection is that Recanati has misrepresented how easy it will be to come up with the golden ticket here. Put in hippy form, Recanati's objection to Jason is that he's not going into the study of particular constructions with an open mind; he's already laid down in advance a strong generalization about the limited role extra-linguistic context can play, and that, Recanti is suggesting, is stifling. We'll get to assess the charge of lack of constraint when we get to 'Making it Articulated'. In any case, these methodological issues about which perspective we should adopt going into the empirical study of different constructions seem about as challenging, rich and important as the issues about who's right, and it's a virtue of Jason review that it brings the former issues into such sharp focus. There's been some further discussion on the thread about Stanley's motivations concerning Cappelen and Lepore's stance on issues about context sensitivity. Here I'd like to discuss one of their tests for context dependence put forward in Insensitive Semantics, since it strikes me as deeply problematic. (ICD) There are (or can be) false utterances of ^S^ even though S (Where ^^ should be read as corner quotes). But I don't think this shows anything at all about the context sensitivity of 'I'. For (2c) could be true even on the bizarre assumption that 'I' invariantly denotes me (i.e. Aidan McGlynn), since my being hungry now does nothing to prevent there from being false past, future or merely possible utterances of 'I'm hungry'. (ICD') There are (or can be) false utterances of ^S^ at t even though S at t.
So the idea is there can be false utterances of a sentence S co-temporally with S being the case. That's the real mark of context sensitivity. '(2d) There is a false utterance of 'Tom is leaving now' even though Tom is leaving now. Suppose Tom is leaving now. Then, obviously, any utterance of 'Tom is leaving now' made at times other than now, say, a few days into the future when Tom isn't leaving, suffices to establish that the test utterance of (2d) expresses a truth." Suppose Tom is leaving. Then, obviously, any utterance of 'Tom is leaving' made at other times, say, a few days into the future when Tom isn't leaving, suffices to establish that the test utterance of (2d) expresses a truth. Unless I'm missing something, the ICD test is pretty hopeless insofar as the aim was to find a necessary condition for an expression to count as context sensitive. (By the way, if anyone knows any literature where this or a related point is made about this test, I'd be very interested to know. I'm still catching up on the literature generated by the book). 'I will argue that pragmatic computations and grammar-driven ones are "interspersed." Implicatures are not computed after truth conditions of (root) sentences have been figured out; they are computed phrase by phrase in tandem with the truth conditions (or whatever computational semantics computes). 1. The Gricean account both under- and over-generates scalar implicatures. 2. Adopting a picture according to which scalar implicatures are computed phrase by phrase in the grammar enables one to explain so-called 'intervention effects' on negative polarity items (NPIs); that is, it helps one explain why NPIs are blocked in certain environments which, by the lights of our best existing theories of NPI-licensing, should allow an NPI. (1) George ate some of the fries or the apple pie. (1a) George ate some (but not all) of the fries or the apple pie. (1b) It is not the case that George ate all of the fries or the apple pie. "The speaker said 'George ate some of the fries or the apple pie, and could as easily have said 'George ate all of the fries or the apple pie', which is stronger. Because she is co-operative, she makes the strongest statement possible, so 'George ate all of the fries or the apple pie' can't be true." (1c) George did not eat the apple pie. In his 2006, Benjamin Russell has tried to respond to both of Chierchia's arguments against the Gricean. Here's his line of response to Chierchia's discussion of constructions like (1). "The speaker said 'George ate some of the fries or the apple pie, and could as easily have said 'George ate all of the fries or the apple pie', which is stronger. Because she is co-operative, she makes the strongest statement possible, so she can't know that 'George ate all of the fries or the apple pie' is true." (2) ~K (to be read: the speaker does not know that) George ate all the fries or the apple pie. (2b) ~K George ate the apple pie. (3) K ~(George ate all the apple pie). (4) ~K George ate some of the fries. (a) K (George ate some of the fries or the apple pie). (b) K ((~George ate the apple pie) -> George ate some of the fries). In fact, Hawthorne argues that even building in the requirement that the subject actually perform the inference in question isn't enough to render closure plausible. But let's stick there for now. The K in Russell's proof is to be read as something like 'it is known to the speaker that'. It seems to be a worry for Russell's response to Chierchia that it forces us to assume that this operator is obeys the strongest, least plausible version of epistemic closure and a distribution axiom. For it seems that even friends of epistemic closure will find these principles hard to stomach. The upshot is, I suggest, that Russell's Gricean response to Chierchia isn't very satisfactory, assuming as it does some very strong, controversial principles governing the operator 'it is known to the speaker that'. Chierchia, F. 2004. Scalar Implicatures, Polarity Phenomena, and the Syntax/Pragmatics Interface. In A. Belletti, ed. 2004. Structures and Beyond. Oxford: Oxford. Hawthorne, J. 2004. Knowledge and Lotteries. Oxford: Oxford. Russell, B. 2006. 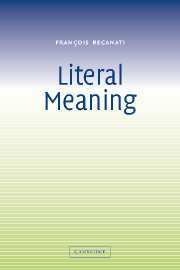 Against Grammatical Computation of Scalar Implicatures. Journal of Semantics 23: 361-82.